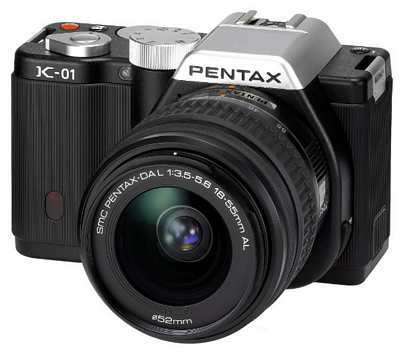 Pentax comes to the “mini” DSLR market with its K-01 camera. The K-01 competes with the Nikon One series, as well as the Panasonic Lumix GX1, Sony NEX-5N and Olympus PEN E-P3. With a street price of approximately $799, it is slightly more than the Nikon and Olympus offerings. The question is, does the price of the K-01 come with features that merit the additional cost? With the interchangeable lenses, as well as its ability to handle other K-Mount lenses, the K-01 offers quite a bit of flexibility and modification potential. The fact it is compatible with other K-Mount lenses makes it a very versatile camera for field use around the world. With this and a few new features, it seems the K-01 is up to the challenge no matter the high price tag. The Pentax The APS-C CMOS sensor was first introduced in the company’s K-5. Due to the success and well-received reviews, Pentax decided to outfit the K-01 with the same processor. Its 16-megapixel range gives crisp clarity to landscapes and action shots. Portrait and macro work suffers slightly at the edges with noticeable noise that needs to be fixed during the post/editing sessions. The APS-C CMOS sensor is powerful and handy, but it does suffer from slightly lower shutter speeds than expected for a camera in this range. While the photo quality far surpasses that of the Nikon and Sony competitors, the slow shutter speed gives it a sluggish performance comparatively. If aesthetics account for anything, then the K-01 stands above the crowd. From the first glance, it is clear that Pentax added a design that is timeless. The hand/palm grip is solid and fits snuggly into most hand sizes, and the controls are well placed and easy to use during shooting sessions. The clear 3-inch LED screen has glare-proof coatings so it is easily used in bright light conditions. The actual design and color options were outsourced to world-renowned designer Marc Newson. Choose from yellow, black or blue body styles. A simple switch allows the lens to come off easily and smoothly. When changing in the field, the ease of lens change means less time is spent with the sensor exposed to dust and particles. The auto range of the K-01 is impressive and comes with pre-formatted options for a variety of shooting conditions. When more control is needed, simply switch from Auto to Manual (A/M), and the camera takes on the qualities of a DSLR camera. Adjusting ISO, aperture and light stops are easily done using the buttons and dials on the rear/top of the K-01. If the outward appearance, style and ergonomics are important then look no further than the K-01. This camera is gorgeous in design. Its performance is good in almost every respect except for the shutter speed. With the suggested retail price hovering near $800, users need to decide if they want to sacrifice a slight performance nod for the beautiful design of the K-01.